Mayville State University is a fully accredited four-year public institution, located in the rural community of Mayville, North Dakota (ND) (population 2,500). As one of the smallest public baccalaureates in the nation, MSU is strategically positioned between the state’s two research institutions. The mission of MSU is to educate and guide students, as individuals, so that they may realize their full career potential and enhance their lives. This is carried out in an environment that reflects personal service, commitment to innovative technology-enriched education, and dynamic learning relationships with community, employers, and society. The vision of MSU is to be known for continuing academic excellence in a cooperative, enjoyable learning environment that anticipates and responds to individual needs. The purpose of MSU includes: (1) Collaborative relationships with schools, employers, and communities that contribute to the economic growth and social vitality of ND; (2) Effective support for appropriate applications of information technologies to instruction and administration; (3) Academic programs and services that address real-world career and ND workforce opportunities; (4) Innovative, flexible delivery of instruction that meets the needs of the individual; (5) Enrollment and revenue development through retention, recruiting, and new opportunities; and (6) Assessment and improvement of student learning outcomes and institutional effectiveness. MSU was established as a normal school in 1889 to prepare teachers. While the University maintains its historical mission, programs beyond teaching are available for careers in business, computer information systems, health & physical fitness, and for continuing study in professional and graduate schools. MSU has added majors in Clinical Laboratory Science, Early Childhood (EC) Education, University Studies, Special Education, Nursing, and Communication, and created a BAS degree in Computer Information Systems and Business Administration. These programs allow articulation for students who have earned an Applied Associate or Associated of Science degree; articulation agreements are in place with 23 institutions. 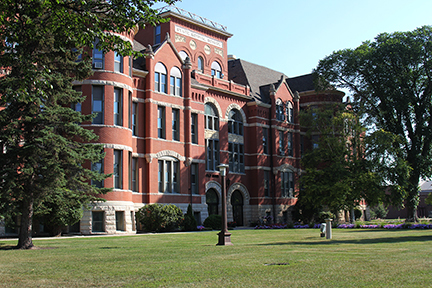 MSU is a part of the North Dakota University System, a unified system of higher education governed by the State Board of Higher Education. The system includes two research universities, four regional universities (including MSU) and five community colleges working in concert to make students’ educational goals their highest priority. Led by the chancellor, the NDUS staff supports the SBHE’s mission to enhance the quality of life for all those served by the NDUS as well as the economic and social vitality of ND. In order to do so, the NDUS has implemented several initiatives which fall under categories designated as Access, Quality, Affordability, Learning, and Accountability. These efforts for efficiency and transparency include admission standards reflecting the missions of each institution, secondary and postsecondary expectations alignment, strengthening academic support services to improve retention and graduation rates, and a uniform tuition model. The NDUS encourages collective work towards the Association of American Colleges & Universities (AAC&U) Liberal Education and America’s Promise (LEAP) initiative. MSU was granted continuous funding from the NDUS for the Science Technology Engineering Math (STEM) initiative. 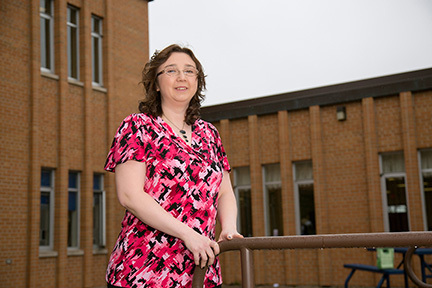 Funding impacted the teacher education program, collaborative P-12 partners, and the community. The university has partnered with the Heart of the Valley Interactive Television Consortium, Red River Valley Education Cooperative, MSU Child Development Programs (Head Start, Early Head Start, and Pre-K), Eastern & Western ND Area Health Education Center, West Fargo STEM Center, and University of ND School of Engineering. MSU has created and provided professional development and distributed STEM curricular kits, lesson plans, and rubrics. The initiative has provided EC, Elementary and Secondary education candidates teaching materials and learning opportunities. In Fall 2011, the unit moved into a new location. A $4,958,325 state funded project, the addition brought a new home for providing adequate, efficient, and safe spaces for learning, collaboration with area schools, and accessibility for individuals with special needs. 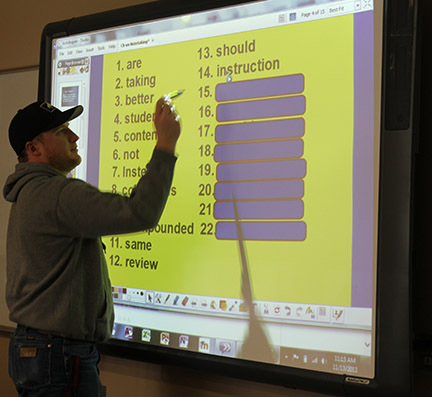 Classrooms are equipped with interactive white boards and Interactive Video Network equipment is also available. The improvements have brought the state-funded Teacher Center for P-12 teachers together with the MSU Byrnes-Quanbeck Library to create an educational resource center available to candidates and the community. The Division of Education and Psychology is led by a division chair who reports to the Vice President for Academic Affairs and includes the following faculty: Full time (n = 9); Part time (n = 43); Adjunct (n = 13). There are 298 students who have declared education majors for Fall 2014. Of these 96 have been formally admitted to preparation programs for Fall 2014; EC (n = 11); Elementary (n = 54); Secondary (n = 31). The mission of the unit is to prepare highly qualified professionals to work with diverse populations in multiple environments. The goal of the unit is for candidates to attain proficiency in knowledge, skills and dispositions of InTASC. The MSU mission statement encompasses the vision that quality education includes a liberal arts component and major field of study for the purpose of helping students maximize their potential through a foundation of personal enrichment, cultural awareness, and breadth of knowledge. Essential studies are founded on the LEAP initiative of the AAC&U. These courses prepare individuals to deal with complexity, diversity and change, and develop social responsibility, problem-solving and practical skills. Courses include 36 credits in English, speech, computer information systems, humanities, social science, mathematics and science; 26 of these credits are requirements for teacher education. The unit is interconnected to all academic disciplines as candidates' studies include content area preparation for degree specialization. In EC and Elementary programs, core requirements of content pedagogy are delivered by the appropriate division. All Secondary programs require a content area course of study, therefore all academic divisions prepare candidates. Faculty from each division and from EC and Elementary education comprise the Teacher Education Committee and make collaborative decisions for admissions, curriculum and improvement. All students are required to complete a minor (or double major). Some candidates choose a minor/double major within other disciplines, thus the unit partners to effectively prepare candidates. Faculty take advantage of formal and informal opportunities for collaborative work with faculty of other divisions through committee work, service and scholarship. MSU has 49 full-time faculty contributing to the education of candidates. 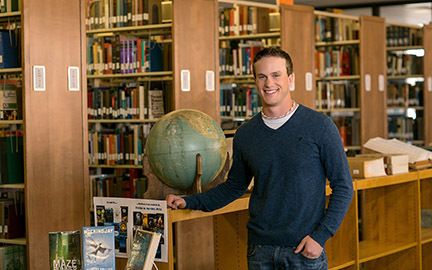 Kyle Beckstead, 2009 Mayville State graduate, reflects on his experiences at Mayville State University, his life as an educator, and his future goals. Program options also include Title I Certificate of Completion †, Kindergarten Endorsement and Middle School Endorsement. Education programs are jointly approved by the State and CAEP as documented in the State/NCATE Partnership Protocol. Currently no programs are accredited by Specialized Professional Associations. MSU is accredited by the Higher Learning Commission (HLC). The unit will be evaluated by HLC as a part of campus-wide reaccreditation during 2015-2016. National recognition in 2004 indicated MSU was the nation's first Tablet PC campus. In 2013 The Princeton Review named MSU as a Best Midwestern College; MSU was also named to the 2015-2016 U.S. News and World Report Best Online Bachelor’s Programs. Mayville State has been named to the Princeton Review's "Best in the Midwest" section of its website feature, "2014 Best Colleges: Region by Region," and has received the "Best in the Midwest" designation for several years running. Chrystal, English and history major at MSU, talks about growing up in locations all over the world and how she plans to use these experiences, along with her Mayville State education, to reach her long-term goal of teaching students abroad. The Reflective Experiential Teacher conceptual framework was designed and adopted by the unit in 1990 (Exhibit I.5.c). Use of the framework supports the inclusion of effective, research-based teaching strategies throughout the unit. It is based upon a belief that teacher candidates develop the ability to reflect on and apply current research findings, theoretical knowledge, and effective teaching practices. Candidates learn how to use inquiry to question and test hypotheses in simulated and clinical experiences with subsequent reflective exercises that develop their ability to analyze and think critically. Recognizing that growth is fundamental to teaching and learning, the unit critically reviewed the model in June 2014. This resulted in continued acknowledgment of its value as it supports standards-based learning outcomes that candidates are expected to meet. The framework is used to guide continual improvement based upon adopted assessment procedures, research, and the Interstate Teacher Assessment and Support Consortium (InTASC) standards. The unit recognizes InTASC standards of content and pedagogy as the proficiencies for teacher preparation and the principles supporting the Reflective Experiential Teacher framework. The standards emphasize that candidates must demonstrate knowledge, performances and dispositions in four categories: the learner and learning; content; instructional practice; and professional responsibility. From this foundation, Student Learning Outcomes (SLOs) for each degree program within the unit ground teaching and learning with a focus on 21st century skills. The SLOs are included in all education syllabi to show the interrelationship between course goals, objectives, CAEP categories and the InTASC standards. SLOs for the unit are in a redevelopment phase. At present, each preparation program has a separate set of specific SLOs that incorporate nuances of content and grade level; a total of 12 separate sets (see Exhibit I.5.a MSU SLOs). However, beginning the 2015-2016 academic year, all programs within the unit will align to one set of Teacher Education SLOs. These SLOs were formed to reflect CAEP categories in Standard 1.1 and the requirements of all ND teacher evaluation systems to be based on the four general categories of InTASC standards; these SLOs guide how the unit will report data. The 12 separate sets of SLOs were critically reviewed by the unit, unit Assessment Coordinator and the Teacher Education Committee in the Fall of 202014. Consensus was reached that all existing SLOs are represented within the new set and could therefore be collapsed into one common set. Longitudinal measures of students' achievement are integrated across the curriculum and systematically evaluated. SLO 1 Learner & Learning: Teacher candidates understand diversity in learning and developmental processes and create supportive and safe learning environments for students to thrive. SLO 2 Content: Teacher candidates understand subject matter deeply and flexibly so they can advance their students’ learning, address misconceptions and apply ideas to everyday life. SLO 3 Instructional Practice: Teacher candidates will plan instruction, utilize effective instructional strategies and technologies, and continuously assess students for mastery and decision-making purposes. SLO 4 Professional Responsibility: Teacher candidates take responsibility for student learning, collaborative relationships, their own professional growth, and the advancement of the profession. The unit also recognizes the habits of professional action and moral assurances, or dispositions, which play a vital role in how teachers perform in practice. The unit established indicators that would exemplify a quality teacher disposition at different progression levels across education programs. The 19 elements that constitute a professional disposition include: timeliness, attendance, dress/appearance, attitude & composure, initiative, ethics & confidentiality, organization, flexibility, awareness, communication, sensitivity to diversity, assessment, cooperation/collaboration, rapport/communication, self-reflection, responsiveness to feedback, lifelong learner, attitude towards learners, and ways to contribute. These elements are used for admissions decisions (in addition to achievement data) and are measured progressively for degree of sophistication during clinical experiences. 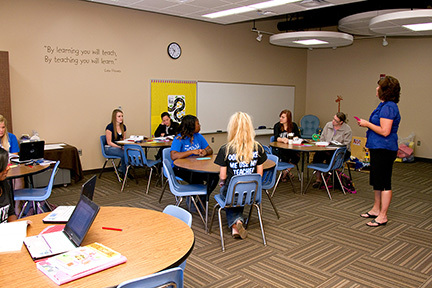 Students intending to earn a teaching certificate must: (1) display satisfactory skills by successfully completing eight identified courses with a grade of C or better, (2) successfully complete Intro to Education and the Pre-Professional Field Experience with a B or better, (3) successfully complete the Praxis Core Academic Skills test with scores that meet or exceed the ND requirements in Reading (156) Math (150) and Writing (160) or secure a composite score of 466 and pass two of three subtests, (4) earn 32 semester hours of coursework, (5) attain a cumulative GPA of 2.75 and (6) receive final approval from the Subcommittee on Admission and Retention. In order to continue in the program, students must maintain a minimum GPA of 2.75, demonstrate expected dispositions as evaluated by instructors and school-based faculty, and continue to obtain satisfactory recommendations from faculty, staff, and field-experience supervisors. Institutional SLO 1 Students will demonstrate knowledge of human cultures and the physical and natural world through study in the sciences and mathematics, social sciences, humanities, histories, languages and the arts. This is focused by engagement with big questions, both contemporary and enduring. Institutional SLO 2 Students will demonstrate intellectual and practical skills, practiced extensively across the curriculum, in the context of progressively more challenging problems, projects and standards for performance. Institutional SLO 3 Students will demonstrate personal and social responsibility, anchored through active involvement with diverse communities and real-world challenges. Institutional SLO 4 Students will demonstrate Integrative and Applied Learning, including synthesis and advanced accomplishment across general and specialized studies. This is demonstrated through the application of knowledge, skills and responsibilities to new settings and complex problems. These standards support students admitted to education programs under the Reflective Experiential Teacher model; they require future teachers to inquire, question and test hypotheses, and to think critically, reflectively and analytically. These skills are the foundation of creating reflective teachers who have the knowledge, performances and dispositions to work with diverse P-12 populations. 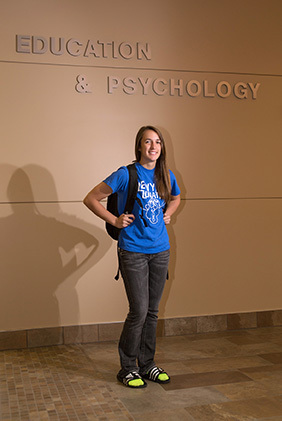 Hear about Taylor's experiences at Mayville State and her plans for the future. The Reflective Experiential Teacher conceptual framework was designed and adopted by the unit in 1990 (Exhibit I.5.c). Use of the framework supports the inclusion of effective, research-based teaching strategies throughout the unit. It is based upon a belief that teacher candidates develop the ability to reflect on and apply current research findings, theoretical knowledge, and effective teaching practices. Candidates learn how to use inquiry to question and test hypotheses in simulated and clinical experiences with subsequent reflective exercises that develop their ability to analyze and think critically. Recognizing that growth is fundamental to teaching and learning, the unit critically reviewed the model in June 2014. This resulted in acknowledgment of its continued value in support of standards-based learning outcomes candidates are expected to meet. The framework is used to guide continual improvement based upon adopted assessment procedures, research, and the Interstate Teacher Assessment and Support Consortium (InTASC) standards. Jacob and Brady discuss their experiences in establishing the Cometeers student volunteer organization at Mayville State. Mayville State University is accredited by The Higher Learning Commission (HLC) and is a member of the North Central Association (NCA). The CAEP Council for the Accreditation of Educator Preparation. Katie, MSU physical education and health major, describes her experiences as a transfer student pursuing a teaching degree at Mayville State. All institutional, program, and faculty information under institutional work space in AIMS has been updated. 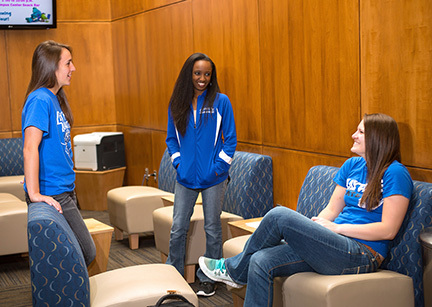 Faculty information and current information about Mayville State is maintained on the university website.